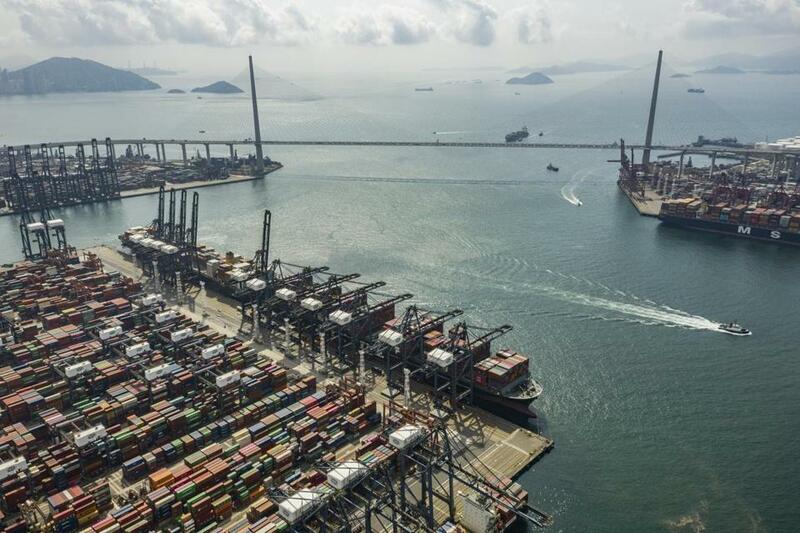 The Kwai Tsing Container Terminals in Hong Kong. Talk are underway. but the US-China trade war is unresolved. BEIJING — Top Chinese economic policy makers promised this weekend that Beijing was ready to open up the country’s economy to more market-based competition and international trade, in the latest sign of strong Chinese interest in ending a multibillion-dollar trade war with the United States. Senior US officials are scheduled to visit Beijing in the coming days for trade talks, with Chinese officials then heading for Washington the following week in an attempt to wrap up a deal. But Chinese officials have an extra incentive in pledging to loosen their hold on the world’s number two economy, and not just to the Trump administration. In addition to a trade war that is hitting the country’s exporters, China’s economy has been hurt by private-sector business leaders who have become increasingly cautious in recent months about making new investments. The economy has slowed, creating a self-reinforcing cycle of skepticism that further private investments will be profitable. State-owned enterprises have claimed a growing share of the loans available, a sign the government may be crowding out the private businesses that could drive future growth. Xi Jinping, the country’s leader, has insisted the Communist Party play an ever-greater role in corporate decision-making and daily life. The promises of economic opening may sound familiar. Chinese officials have said for years that they were ready to allow foreign competitors to enter their market on a more equal footing, with slow progress. The promises made over the weekend in many cases repeated pledges made before, such as to open the country’s financial sector more widely to foreign investment. The tone of remarks at the weekend session of the China Development Forum, the country’s premier annual economic policy conference, was nonetheless striking. It appeared to represent a coordinated effort to present an international image of China as a country moving in the direction of greater economic openness. Han Zheng, one of the seven men who run the country as members of the Communist Party’s Politburo Standing Committee, said China wanted to keep increasing imports. “We do not strive for a trade surplus,” he said. Yi Gang, governor of the central bank, said China wanted more foreign investment. He said the government was looking for ways to let foreign investors trade derivatives and other financial instruments so as to limit their exposure to risk. Such a move could mean loosening Beijing’s controls over the value of its currency — a politically sensitive subject — but Yi offered no details. Chinese officials also emphasized their willingness to allow foreign banks, securities firms, insurers, and asset-management companies to buy larger stakes in their Chinese competitors. Trump’s remark on Friday that the United States would keep the 25 percent tariff it imposed this past summer on $50 billion a year of Chinese goods drew irritation at the forum. For the United States to insist on keeping tariffs could “ruin the whole base of this negotiation,” said Zhu Min, an influential adviser on economic policy issues in Beijing and a former senior central banker in Beijing and former deputy managing director of the International Monetary Fund in Washington. The Trump administration had consistently taken a hard line for many months on retaining the tariffs on the $50 billion a year in goods. The administration has been much more willing to discuss removing a 10 percent tariff imposed in the fall on another $200 billion a year in goods. But corporate lobbyists have mounted a strenuous campaign for the repeal of all tariffs, including on the $50 billion in goods. Chinese officials have been hoping that campaign would be successful. An extensive interagency effort by civil servants and political appointees produced the $50 billion list of products. They came up with product categories in which they did not want the United States to become more dependent on China. Some products were included for reasons of national security, such as components for nuclear reactors and aircraft. Others were on the list because they were deemed important for economic security, including cars. China needs to ramp up car exports because its home market has slowed sharply since summer. That has left dozens of factories operating at half capacity or less. Xi Guohua, president of China’s FAW Group, a giant automaker, said at the forum that automakers and their suppliers directly or indirectly employed 12 percent of the country’s workforce. Other estimates have been lower. At a separate gathering Friday organized by the Center for China and Globalization, a Beijing research group, former senior US and Chinese officials also expressed worry about whether the US-China relationship can be quickly fixed even if a trade deal is reached soon. A former Treasury secretary, Lawrence Summers, warned that worries about China had become bipartisan. “There is a better than even chance that the Democratic candidate in 2020, in speaking about foreign policy, will criticize Trump for being too conciliatory toward China,” he said.